Lots of real world problems are complicated. Not only are there many factors involved, but also these factors are inter-related. It’s hard to cut through all the factors and get to the core of the issue. To see the gist of the issue is at the heart of situational analysis – which is vital for planning and execution. There are many tools available to help dissect and analyze issue, and my personal favorite is the mental framework of 2 by 2, which pick out two most important factors of the issue, and draw them on the two axis of Cartesian coordinate system. The resulted image has four quadrants, analyzing the four quadrants would provide lots of insights to the situation and the plan for execution. The four quadrants give a clear picture of where different activities of our daily life are located. Not only that, a second picture will show the consequence of focusing (or being driven by) each of the quadrants. 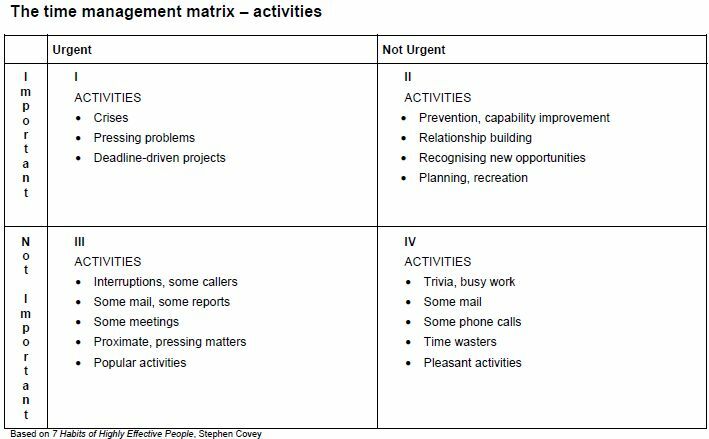 From this simple 2 by 2 matrix, it’s clear that to maximize our time usage, we should focus on quadrant II, where we spend time on planning and prevention, and building up capabilities and relationships. 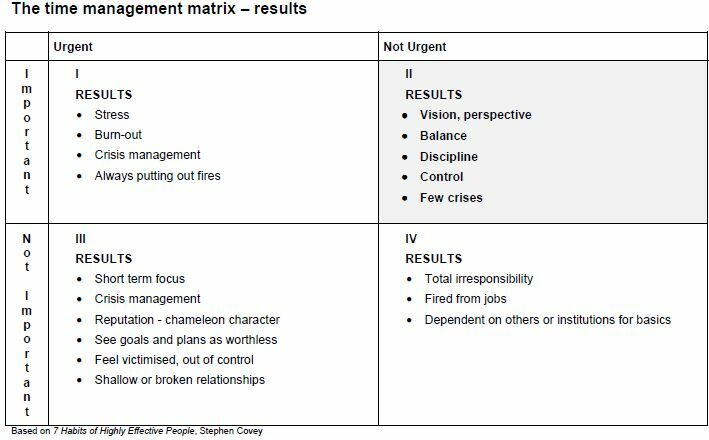 This simple 2 by 2 matrix is the base for the famous 7 habits of highly effective people, and it shows how powerful this simple tool can be in analyzing various issues. I will spend my time here documenting and discovering all the 2 by 2’s coming my way, and hope you enjoy it. This entry was posted on November 18, 2009 at 3:09 am and is filed under Uncategorized. You can follow any responses to this entry through the RSS 2.0 feed. You can leave a response, or trackback from your own site.